The Beluga Diamond was cut by the William Goldberg firm from a rather flat, blocky 265.82-carat rough and weighs 103-point-some carats. I am still researching it. 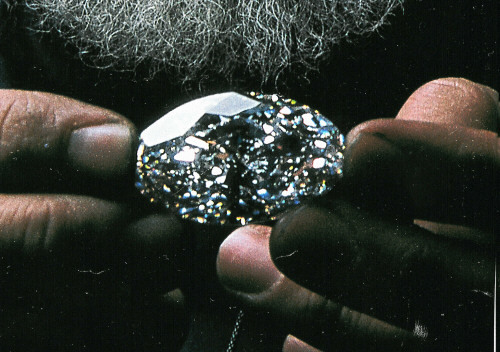 It is the largest standard oval brilliant cut diamond in the world and appeared in an article about 'blood diamonds' in the March 2002 issue of National Geographic magazine. 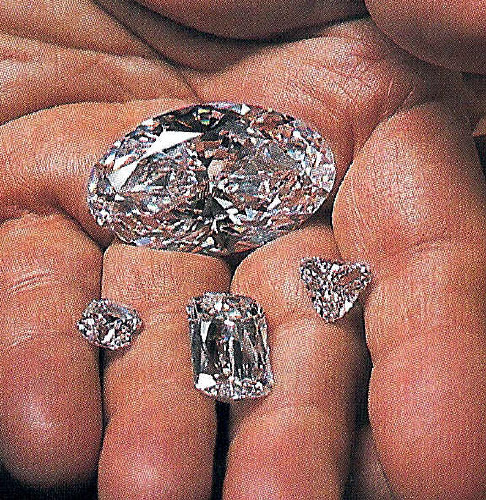 The Beluga, along with the smaller stones that were cut from the diamond crystal. The rectangular-looking stone is an Ashoka cut. This cutting style was developed by the William Goldberg firm, the first Ashoka cut is named the Ashoka Diamond and incidently was a 41-carat D-color Flawless stone from the Golconda area of India. The cutting style is a rectangular but the ends are rounded and the pavilion and crown have a number of facet edges creating criss-crossing patterns. Some of them are a little more towards square, others, like this one, more rectangular. On the right is a triangular or heart shape (can't quite tell) and on the left appears to be another Ashoka cut or possible a standard cushion cut.